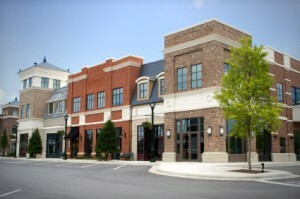 The Town Center minimizes the need to travel outside of the community for daily needs like taking the kids to daycare, grabbing morning coffee with friends, or your afternoon workout. It features a variety of convenient shops and restaurants, a premiere fitness center, numerous professional services, a state of the art pre-school, and the convenience of the neighboring 18-hole West End Golf course. The Town Center boasts a number of events including the constant Tioga Monday Market, an outdoor farmers market, as well as Movies on the Square on Fridays, and Spring and Summer Concert Series’. As part of the Town of Tioga community, Tioga Town Center is a convenient amenity as well as a leading destination to shop, work and dine in Alachua County. To us, it is about being aware of the “build environment” that surrounds you and how it affects us all. That environment has to create a balanced approach to how we all live with our neighbors and our common open spaces. Our open spaces provide ample stretches of shaded sidewalks, that are set back from the curb to help you relax and enjoy the outdoors. 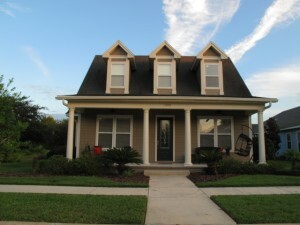 Our homes are centered around their welcoming porches and stoops. Their front doors highlighted to create a sense of Community and our pedestrian way of living, while the garages are hidden to allow an escape from the everyday. Our homes are not segmented by value, or barricaded behind brick walls, they are all connected by our shaded walkways. Town of Tioga is a Community full of open spaces that allow for picking flowers from your Community Garden plot, shopping via bicycle, strolling with your loved ones to dinner in the Town Center, or watching an outdoor movie under the stars with your family. Town of Tioga prides itself on being a pioneer in the area of smart growth in North Central Florida. Smart Growth is a style of community planning in which the designers integrate a compact design, land for mixed uses, a range of housing choices, and a walkable layout with a strong emphasis on the preservation of open space and natural beauty. In addition to the development of high-quality homes and lifestyle, Town of Tioga places great emphasis on sustainability and preserving the environment. Almost 30% of Tioga’s land is reserved for lush, green areas. Throughout the community are landscaped retention ponds and gardens, which support environmental preservation as well as stylish aesthetics for the neighborhood. The community layout focuses on pedestrians, encouraging residents to walk to school and the retail center, thereby lessening pollution from vehicle exhaust. Low lighting along streets and sidewalks minimizes light pollution and trees that line sidewalks and roads provide shade throughout the neighborhood. Drive or walk through Town of Tioga and you will always be very close to our most important and impressive amenity: our Esplanades. Esplanades (or promenades) are the spine to our Community. They are remnants of days gone by where the farmers tress grow along the sides of open fields. Town of Tioga is a jewel of Alachua County as well as a blue print for modern day community development nationwide. Town of Tioga has been the recipient of the 1998 ENVY Award, given by the Florida Association of Realtors for the Best Community in Florida, which recognizes preservation of natural flora, blending with surrounding environment and overall design. Thanks to the homeowners, showcase builders and the Tioga Realty team, the Town of Tioga also won the Gold award “Best Smart Growth Community” in the nation! Sponsored by the National Association of Home Builders and Professional Builder Magazine, this award is the nation’s foremost residential design competition and pays tribute to those who efficiently and innovatively produce communities with residential, commercial and recreational uses while providing open green space and protecting environmentally sensitive areas. Town of Tioga was recognized specifically for its master-planning which takes advantage of natural land features, its amenities, future retail district plans, pedestrian focus, and access to the natural environment. With the proven integrity and commitment to excellence of developers Miguel and Luis Diaz, Town of Tioga will continually be a community recognized for state-of-the-art design, smart growth and traditional values. Over many years majestic oaks lined the sides of the country roads, creating a lush and inviting tree canopy that beckons you to walk beneath it. Every home is just a block away from one of our walking paths. Community Pool, Tennis Courts, Meeting Hall, Basketball Courts, Town Center, Community Garden, & Town Square. More than 60% of the instructional staff hold advanced degrees. The county manages 24 elementary schools (including 10 centers), seven middle schools, seven high schools, and 15 Charter schools, for a total enrollment of more than 30,000 students. For the last several years, the district has received the “What Parents Want” Award from SchoolMarch, the nation’s largest school selection consulting firm. Three schools in Alachua County have met the criteria to be designated a “Five Star School”, recognizing their exemplary programs that produce higher achievement through the integration of Business Partnerships, Family Involvement, Volunteers, Student Community Service and School Advisory Councils.